We hope you are having a relaxing summer whiling away the time dreaming up an exciting topic for your first Ignite Talk as we would love a few more people to step forward to help us kick off our September event. Yes, Ignite is back on 4th September with another round of lightening fast talks to put a smile on your face and skip in your step. Before we go on and tell you what an awesome event Ignite is with inspiring speakers willing to get up on stage share their knowledge and insights into everyday subjects – we should really say that we are looking for a few more speakers to step forward. We do have a very respectable number but we always want more as we know our audience do also. If you would like to submit a talk then please use the Submit a Talk menu item above and if you are still undecided then watch video below. 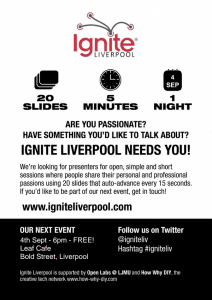 Go on share your passion at Ignite Liverpool! !